UNESCO, with financial support from Japan, held the Second Sub-Regional Workshop on Mainstreaming Education for Sustainable Development and Evaluation of the Project “Sustainability Begins with Teachers in Central Asia” in Tashkent, Uzbekistan, on 11-13 April 2018. This workshop was the final workshop of the one and a half year “Change Project” to build capacities of Teacher Education Institutions to teach non-cognitive competences through the Education for Sustainable Development (ESD) approach. 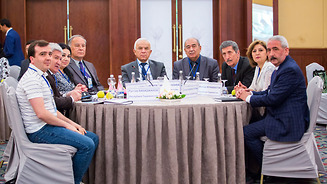 The event aimed to establish synergies between teacher development and education policy on Education for Sustainable Development; evaluate project activities on mainstreaming different ESD approaches into programmes of Teacher education institutions (TEIs); and agree on the sustainability of the project at sub-regional and national level in Central Asia. Representatives from the Ministries of Education and Science, national project coordinators, and 27 participants from TEIs in Kazakhstan, Kyrgyzstan, Tajikistan and Uzbekistan attended the seminar. In addition, international experts from Georgia, Sweden and Lithuania, education specialists from UNESCO Bangkok, Almaty and Tashkent offices, and other international and regional agencies, including the Regional Environmental Centre for Central Asia, Organization for Security and Co-operation in Europe (OSCE) and Institute for International Cooperation of the Deutscher Volkshochschul-Verband (DVV International), shared their expertise. Elaboration of the evaluation and sustainability tools, which will support project TEIs in implementing further changes to mainstream ESD within their institutions and country. A number of different activities, including workshops, trainings, roundtables and initiatives in Kazakhstan, Kyrgyzstan, Tajikistan and Uzbekistan were organized under the framework of the project "Sustainable Development Begins with Teachers in Central Asia". A large number of educators, university staff and students received new skills and knowledge in the direction of ESD. Institutional change plans, implementation strategies and new training methods have been developed.